I have listened to John MacArthur’s response to a question about what the Bible would say about Charlottesville 3 times. He gave a masterful biblical explanation of how desperately wicked the human heart is. The people who were there exploding with anger have given testimony about what their anger was directed toward and they seem to know very well it was all about race! 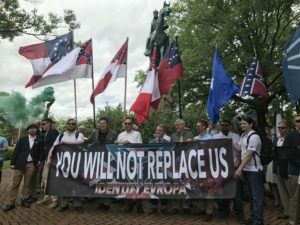 Mr Spencer is one of a number of white nationalist leaders who have given voice to a legion of angry white men who feel that their status in America is being eroded by multiculturalism, feminism, global trade and affirmative action. “Our people are subjugated while an endless tide of incompatible foreigners floods this nation every year,” the group says on its website Vanguard America. “If current trends continue, White Americans will be a minority in the nation they built. “We’re never backing down. The fact that you treated us this way, the fact that you treated American citizens who are peacefully assembling this way is an absolute outrage. “I have never been so offended in all my life … You think you won? You looked like complete fools. “And we’re going to make even more of a fool of you when we’re back here because we do not give up. It is crucial for Christians to understand that the heart of our problems resides in the evil hearts of mankind. However, that was and is not the only truth on display in Charlottesville and our society at large. Please let more of our pastors and ministry leaders step forward and not minimize what was also on display in Charlottesville on August 12th — ugly, hostile, dehumanizing, treacherous, hateful racism. We have this future to look forward to and to work toward!